Brazil´s presidential elections next month will be one of the biggest tests the country´s democracy has ever faced. 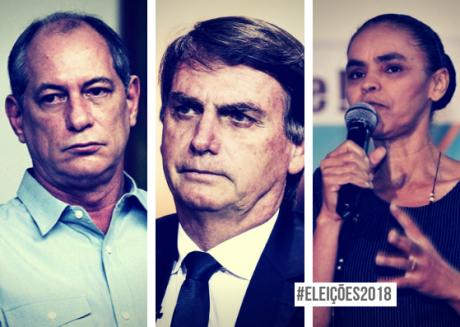 Aside from choosing the country´s president, the members of the lower house of Congress and two-thirds of the Senate, as well as governors and state legislators, Brazilians will decide if the ballot remains stronger than the bullets. Corruption, inequality and a lack of security have undermined the political institutions’ ability to convince many citizens that democracy is worth defending, opening the doors for a nightmare from the past. An avowed admirer of Augusto Pinochet, Bolsonaro wants to increase the role of the military in government and to radically reform the Supreme Court. Voters will have to decide on October 7 between a democratic, albeit dysfunctional system, and an authoritarian deviation that openly flirts with violence, torture and censorship. Most Brazilians are not happy with their democracy - it´s easy to understand why. A recession in 2014, triggered by fiscal irresponsibility and misguided economic policies, left thirteen million people unemployed and cut the country´s GDP by 8.6% in two years. An investigation into money laundering, known as Lava Jato, uncovered an intricate scheme of political and corporate illegal payments that hindered citizens’ confidence in their political system. Moreover, Dilma Rousseff´s impeachment two years ago fuelled social polarization, which Michel Temer was unable, or only too happy not to quell. The judiciary struggle against corruption is proving to be effective, hunting down corruption and holding Brazil´s political class accountable. Politicians across the political spectrum have been indicted, from local elected officials to former presidents. However, this overdue investigation is also shattering the citizens’ faith in democracy, opening the doors for the performance of superstar judges who tend to overstep their marks and put their political motivations and sympathies over justice. Corruption and insecurity, combined with high unemployment rates, make a dangerous cocktail – particularly before elections. And as the citizens’ confidence in their political institutions reaches a new low, many fear that Jair Bolsonaro may have a chance to achieve the unthinkable: a return to military rule in a country that freed itself from the shackles of dictatorship only three decades ago. As memories of oppression begin to fade, many Brazilians believe that the only way to fix the system is to bring the military back to power. Unaware or unmoved by the crimes committed by the military dictatorship that ruled the country from 1964 to 1985, many have decided it is time to give Jair Bolsonaro “a chance”. The presidential far-right candidate is a former army captain and a polarising figure in Brazil. He is known for his comments against women and minorities, as well as for being an apologist for military dictatorship and torture. Bolsonaro served under a regime that used systematic repression to maintain “law and order” and was responsible for the registered killing of one hundred and ninety-one Brazilians and the “disappearance” of another two hundred and forty-three. In 1993, he called for the closing of Congress and claimed Brazil would “never resolve serious national problems with this irresponsible democracy”. Later, in 1999, he called for a civil war that should kill thirty thousand people - including Fernando Henrique Cardoso, the president at the time. An avowed admirer of Augusto Pinochet, Bolsonaro wants to increase the role of the military in government and to radically reform the Supreme Court, undermining checks and balances in the process. However, his campaign is mostly centred on himself as a political figure with a following of 8.5 million in social media, which he galvanizes through his outbursts against legal abortion, drug liberalization and gun-control. Bolsonaro’s support base includes a portion of the educated middle classes and those living in small towns, especially in the South and the Midwest. His law and order discourse against criminality has convinced many Brazilians that he is the right man for the job. According to some recent studies, however, he is doing better in the states where corruption is the voters’ number one concern: many Brazilians perceive Bolsonaro as the anti-corruption messiah who has come to free Brazil from the Workers’ Party. Back in 2016, few imagined that Jair Bolsonaro could become a serious contender for the presidency. The worst recession in the country’s history, Dilma Rousseff’s impeachment and the lack of confidence in political institutions help explain how a far-right politician who champions intolerance, hate, racism and militarism is Brazil's front-running presidential candidate today. Lula da Silva remains the country most popular politician. He led all the polls, but he is currently serving a twelve-year sentence for corruption and was barred by the highest electoral court from standing at the forthcoming presidential election in compliance with the current electoral law - which was passed during his presidency. While centre-left supporters may indeed transfer their votes from Lula to Haddad, most polls indicate that millions of Brazilians have not made up their minds yet and experts caution that potential transfer of votes is hard to measure. The former president decided to appeal against the decision to the Supreme Court and to the United Nations Human Rights Committee, what most experts believe was a strategy to exploit voters’ sympathy and successfully transfer his votes to Fernando Haddad, his vice-president, who replaced him as presidential candidate on September 11. Haddad, a former mayor of São Paulo and former minister of education, was responsible for expanding the country´s education system, building new universities and opening their doors to students from different social and racial backgrounds. Although he lacks Lula´s charisma and influence, he represents a new generation of progressive political leaders which Brazil desperately needs if it is to put the past behind and guarantee cultural, economic and social progress. But while centre-left supporters may indeed transfer their votes from Lula to Haddad, most polls indicate that millions of Brazilians have not made up their minds yet and experts caution that potential transfer of votes is hard to measure. Polls show Bolsonaro leading in the first-round with 26% but losing against most candidates in the expected runoff. Trailing behind are Fernando Haddad (PT) and Ciro Gomes (PDT), a former leftist governor of Ceará, with 13%, Geraldo Alckmin (PSDB), a centrist former governor of São Paulo, with 9%, and Marina Silva, from the Sustainability Network Party, with 8%. The stakes couldn’t be higher in Brazil. Its future depends on its citizens´ responsibility and their commitment to democratic values. In the last years, most politicians have failed the country and have been driven by their own interests. Others who had come to believe that they were demigods have been brought down from their pedestals. But democracy must prevail if the country is to prevent future generations from growing up in darkness and repeating the mistakes of the past. The knife attack on Bolsonaro last week was, in this sense, an attack against democracy highlighting the fact that violence has been reintroduced in Brazilian politics. As emotions and nostalgia, hatred and fear appear to permeate everyday life and reason is increasingly unable to moderate political debate, few pundits venture to predict the result of the elections. Most candidates find it difficult to accept the legitimacy of their opponents, and the conflict between left and right has reached dangerous levels. In March, Marielle Franco, a city councillor and human rights defender, was murdered in Rio de Janeiro. A few days later, Lula da Silva´s campaign bus was shot at in southern Brazil. Today, separating rationality from emotion is becoming almost impossible in Brazil – and this is dangerous. To a martyr in jail, we must now add another one in hospital who won’t waste an opportunity to profit from the situation. So, as emotions and nostalgia, hatred and fear appear to permeate everyday life and reason is increasingly unable to moderate political debate, few pundits venture to predict the result of the elections. Yet, the fire that engulfed the National Museum in Rio de Janeiro, the biggest natural history museum in Latin America, ought to remind the country about its past - sometimes bright, sometimes dark. Remembering that Bolsonaro represents the latter should be enough for most Brazilians to do the right thing and vote against him.